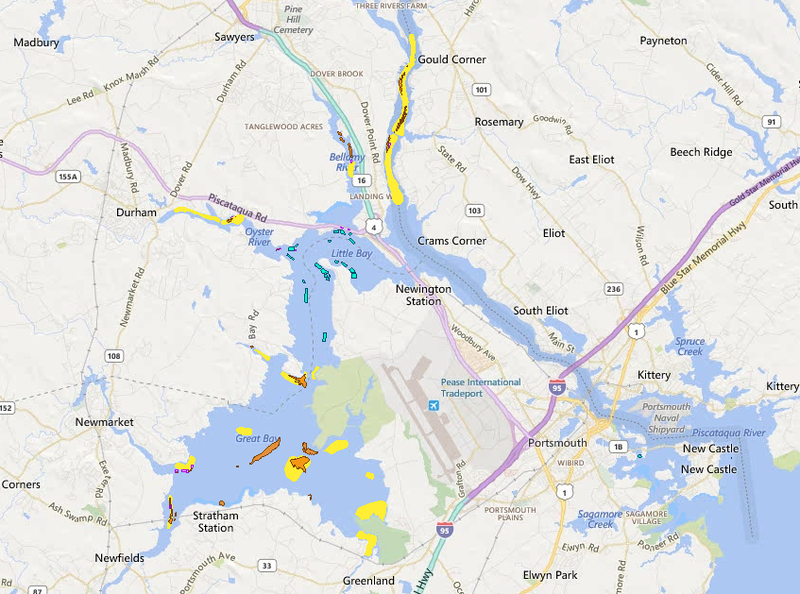 Map info: This map shows oyster area lost since 1982 (yellow), existing natural oyster beds (orange), oyster restoration areas (purple), and oyster farms (turquoise). Map created by Kirsten Howard in October 2015 using the NH Coastal Viewer. Coastal Viewer data layers depicted in this map include historic shellfish resources from 1982, current shellfish beds, shellfish restoration sites, and shellfish aquaculture. The Howard family’s oyster feast straight from Little Bay, NH. Great Bay Estuary, NH – Delightful subtleties in texture and taste greet the Howard family at dinner time at their lake house in central N.H. The oysters at this table came from a local oyster farm on Great Bay called Virgin Oyster Company. 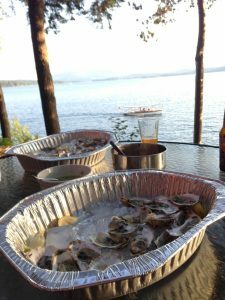 It’s unlikely that any hungry family thinks about the additional benefits of oysters beyond tempting their taste buds, such as cleaning 20 gallons of water per oyster per day in Great Bay. These rock star bivalves even have the ability to help buffer the shore from waves and slow down erosion. In some parts of the country, shoreline management, a general term used to describe both structural and non-structural ways to protect people, public and private property, and natural resources on and behind the shore, includes the use of oysters. For instance in the mid-Atlantic and southern parts of the east coast, coastal managers are using oysters as part of the suite of strategies to help stabilize the shore. The technique of using oysters and other natural materials, such as plants, is called ‘living shoreline’ and has the added bonuses of providing habitat, cleaning water and not contributing to erosion problems, which hardened structures like walls have been criticized for. 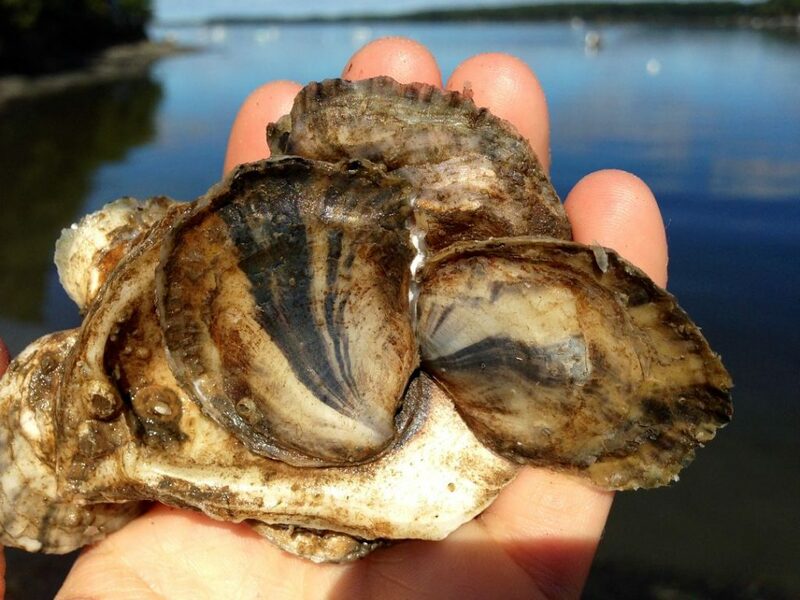 Could oysters strategically be used to help stabilize N.H.’s Great Bay Estuary’s shores as well? And what role do people play in helping the oyster provide its multitude of services in N.H.? Here in New Hampshire, we are at the northern most range of the eastern oyster. This matters because oysters need to be in temperatures above 20 degrees to survive and being exposed without the cover of water in winter freezes and kills them. But people who work with oysters have been noticing that some oysters growing in N.H.’s intertidal zone— the area where part of the day the tide comes in and covers it with water and part of the day the tide goes out and leaves the area uncovered — are surviving the winter under the cover of algae called rockweed. According to Ray Grizzle, a University of New Hampshire research zoology professor and local oyster farmer who has been working with oysters since 2000, the rockweed shelters keep the oysters growing underneath warm enough to live through the tide going out and leaving them at the mercy of N.H.’s winter elements. 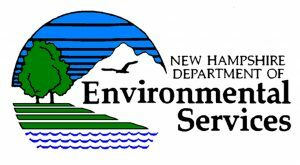 Grizzle said that there are two areas in N.H. where oysters currently live in the intertidal zone: one on the Squamscott River and one on the Lamprey River. When the tide is low and a storm occurs, Grizzle said that the reef on the Squamscott is likely providing some wave buffering. The Nature Conservancy’s recent Director of Marine Science & Conservation Ray Konisky said that he thinks some oysters on the shore of the Lamprey are surviving through the winter (Konisky has moved on to a new position since the time of this writing). “We have several shallow reefs down by the Lamprey (you can see them at low tide right at the mouth) and it would be useful to see about any wave dampening. It looks like the shallow oysters are mostly getting through the winters, which is crucial,” he said. But winters are the least of a N.H. oyster’s problems. Once widespread and dense in Great Bay Estuary, adult oyster populations plummeted with 90 percent losses by the year 2000 following disease outbreak in the 1990s. Currently in the Great Bay Estuary, there are about 125 acres of natural oyster reef, 50 acres of oyster farms, and 20 acres of restored reef compared to 500 or more acres of reef historically. Additionally, today’s oyster beds are only 10-20 percent as dense as they were even in the 1990s. The density has implications for shoreline management because the denser an oyster reef, the more protection from waves it can potentially provide. Disease has continued to reduce the life span of adult oysters, going from 10-20 years pre-disease to a current mere 3-5 years. To top all of that off, during their short life spans oysters are under constant threat of being killed from sediment movement and harvest, according to Grizzle. If you’re an oyster in Great Bay, if you’re not dead yet from sediment or the rake, you will be from disease within five years, making it especially important to help oysters reproduce and their babies, called spat, to survive. Enter the Oyster Conservationist Program. Now in its tenth year of operation, this volunteer-based restoration effort run by The Nature Conservancy together with the University of New Hampshire, recruits and trains volunteers how to raise baby oysters on their private docks that are later used to help restore oyster reefs in Great Bay. 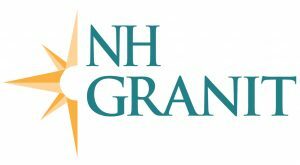 For the 2015 season, there were 81 active sites in the 14 towns in the Seacoast areas of the Piscataqua region of N.H. and Maine, the most active sites in the program’s history. Third-year Oyster Conservationist Liz Bratter (left) receives her cage of baby oysters, called spat, from The Nature Conservancy’s Oyster Conservationist Volunteer Program Coordinator Jessie Batchelder. Liz will clean and check the cage weekly for predators until the oysters are big enough to be moved to a restoration site in Great Bay in September. Photo by Megan Latour/The Nature Conservancy. The oyster conservationists each receive a cage full of shells with the baby oysters—spat—on them in mid-July, and host the spat until they are big enough to be moved in September. The spat comes from hatcheries in Maine and is raised on shells at the UNH Jackson Estuarine Lab before being distributed to the volunteers. Some of the shells in the cages are clean—without spat—and help researchers learn valuable information about where in the Bay wild baby oysters are coming in to use the shells all on their own. Oysters prefer to grow on shells, and stay in the same place throughout their lives because they permanently cement themselves to whatever substrate they settle on. Oyster conservationists help keep the baby oysters alive by monitoring their cages weekly to clean any fouling off and to remove predators like green crabs. They also measure the growth of the oysters biweekly. This year’s crop of oysters raised by the oyster conservationists will be used as part of a 2.5 acre restoration project in Great Bay near Greenland. The 20 acres of restored oyster reef in the Great Bay Estuary are the result of five years of collaboration between many partners, including the UNH Jackson Estuarine Laboratory, The Nature Conservancy, and Natural Resources Conservation Service. Something that researchers have discovered is that restoration sites need to be located close to native oyster reefs to have the highest probability of attracting spat, said Grizzle. Restoration practitioners look at relic reefs and add to them, said Konisky. “We build near live oysters, where nature is showing us that they’re doing OK,” said Konisky. These baby oysters (spat) were fostered by oyster conservationists and then used to restore oyster beds in Great Bay. There are some relic reefs with living oysters close to shore in the intertidal zone on the Squamscott and the Lamprey Rivers. Some oysters have been added to the natural oysters at the Lamprey site as part of the restoration efforts. 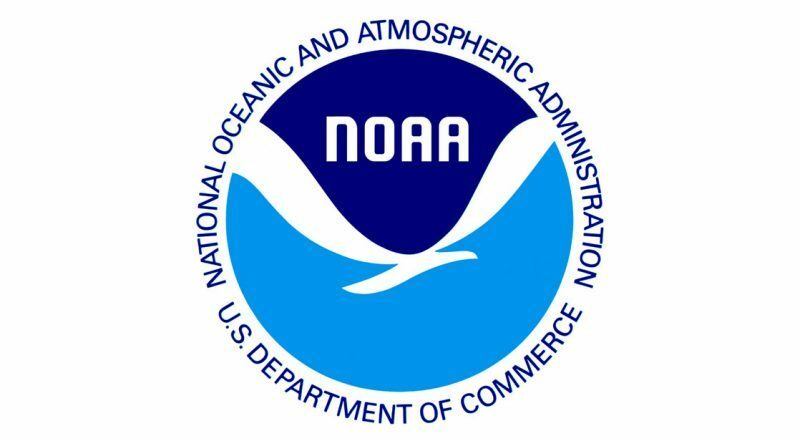 As recently as 1982, according to data from the N.H. Department of Fish and Game, oysters grew close to the shore in several areas in the Great Bay Estuary, including in the Winnicut River bed and Pickering Brook bed near Greenland. Run-off from storm events dump silt and clay into the estuary, and sedimentation continues to be a serious threat to restoration sites as well as all oysters living in the estuary, noted Grizzle. Oyster reefs in deeper water and with channels have currents that provide food to the oysters and minimize silt, both advantages to oyster survival, said Konisky. To give oysters a better chance at success, restoration sites are more often located in these deep channels. But it turns out that there are oysters living near the shore that are neither a part of restoration projects or natural reefs—they are being raised for people to eat. Fifty acres of oysters grow at the 16 oyster farms in Great Bay. 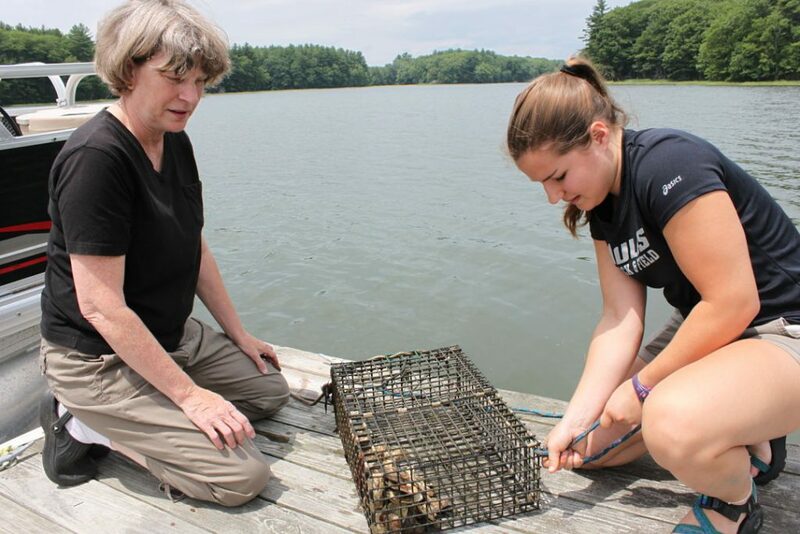 “As farmers, we can give back,” said Krystin Ward, owner and operator of Choice Oysters and Research Technician at UNH Jackson Estuarine Lab. Farmers help oysters spawn and grow each year. More oysters mean more habitat, more filtering of the water, and more benefit to the Bay. Grizzle, co-owner and operator of Granite State Shellfish, home of the “little grizzly” oyster, said that farmers also have an important role to play in restoration efforts and is working with the Natural Resources Conservation Service as a potential funding source to help oyster farmers do more. Ward even sees a potential link to shoreline management and farmers. For instance, the cages full of oysters at the oyster farms, most of which are in the subtidal zone—the area that stays submerged during low tide—, could potentially provide protection from waves. 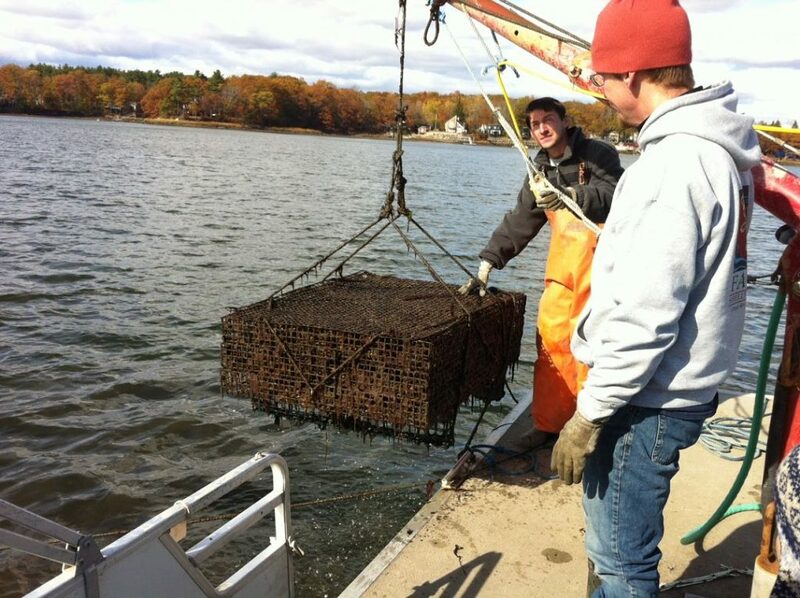 Owners of Fat Dog Shellfish Company clean their oyster cages on Little Bay, NH. Much is unknown about the future of oysters in the Great Bay Estuary as well as their potential to be used as living shorelines to help stabilize our shores. 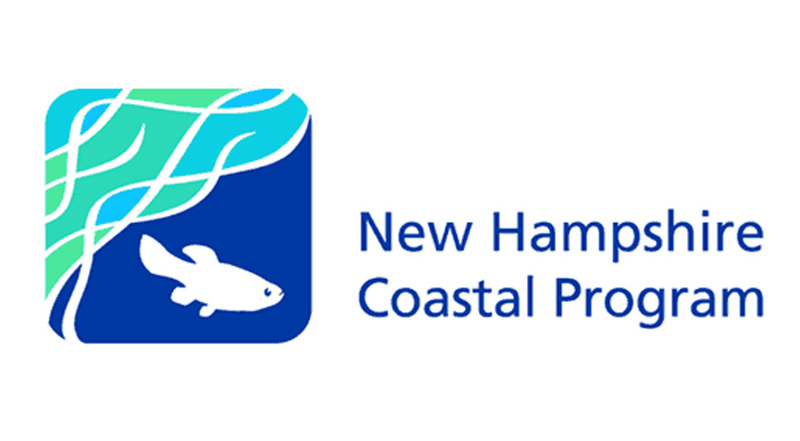 “The living shoreline concept is really just developing here in N.H. and we would like to investigate it more around the use of oysters. But it’s still just an idea around here that would be best served by a scientific experiment to test the concept,” said Konisky. One thing is clear—there are many people, including restoration practitioners, volunteers, researchers, and oyster farmers in and around the Estuary working to help oysters overcome the hardships during their short lifespans, and that means oysters have the chance to help us out too. Learn more about living shorelines at the NOAA Restoration Center website.